CJI is hosting public event with presenters Dr Ricardo Angeles and Sr Petite Lao (see poster below or download poster here) on Sunday, 19 August 2018, from 3:00 to 4:30 pm at Our Lady of Lourdes in Toronto. There will be refreshments and an opportunity for questions at this event. If you cannot make it in person, look for a report and video of the event on our website! 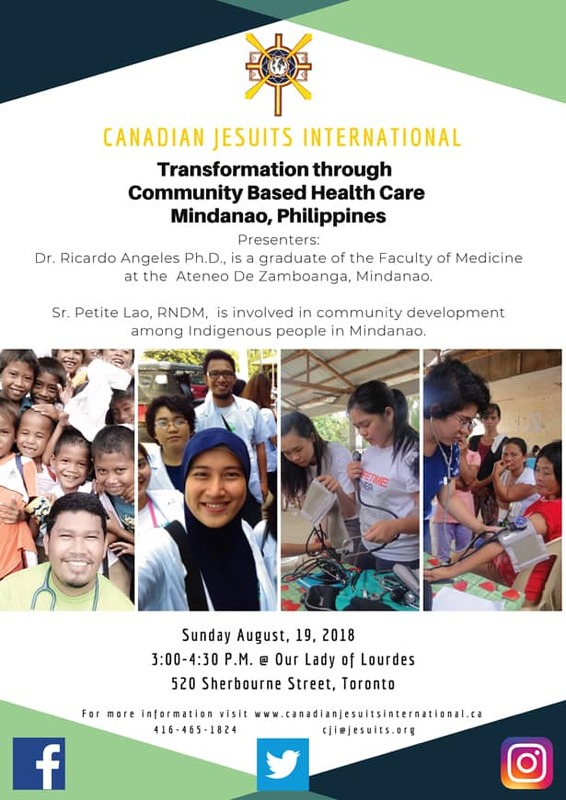 Canadian Jesuits International is hosting this event because of our close ties to the School of Medicine at Ateneo de Zamboanga University (ADZU) in the Philippines. CJI supports a scholarship fund and immersion program for promising young men and women during their four years of medical training. The primary purpose of School of Medicine is to train physicians to provide urgently needed community-based healthcare. The school itself is a joint project between the Zamboanga Medical School Foundation and ADZU, which is a Jesuit university. Dr Angeles PhD is a graduate of the ADZU School of Medicine and Sr Lao, RNDM, is involved in community development among indigenous people in Mindanao. This event is part of CJI’s Open Doors Series, which aims to “open doors” on understanding of issues and realities of partners in the Global South. For more information, visit Philippines – School of Medicine. Within a few months, we initiated numerous improvements, from revising simple forms to planning for sustainable health programs… We want to provide quality service with compassion.